which incorporates the ancient the High Altar. NOTE: A temporary altar was placed in front of the Ancona. so that the Celebrant is directed to the Assembly. 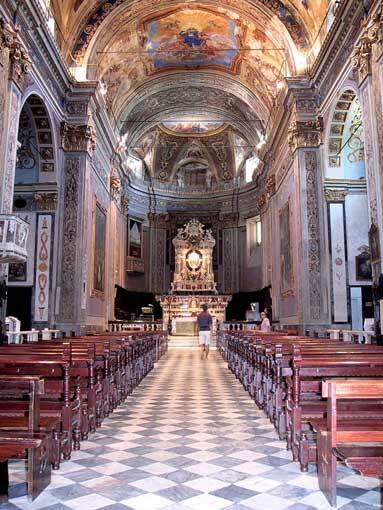 the Icon of the Madonna di Pia. 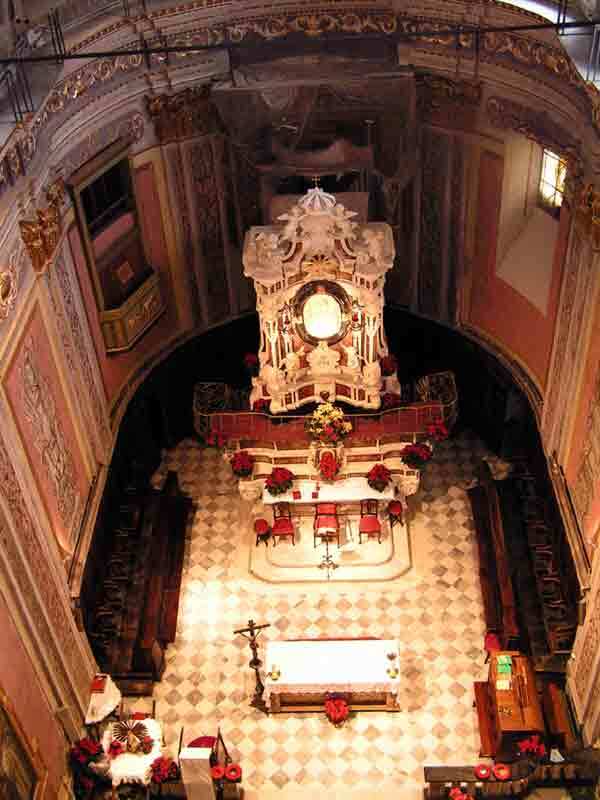 We read in an operetta on our Shrine written by the historian P. G. Salvi O.S.B. 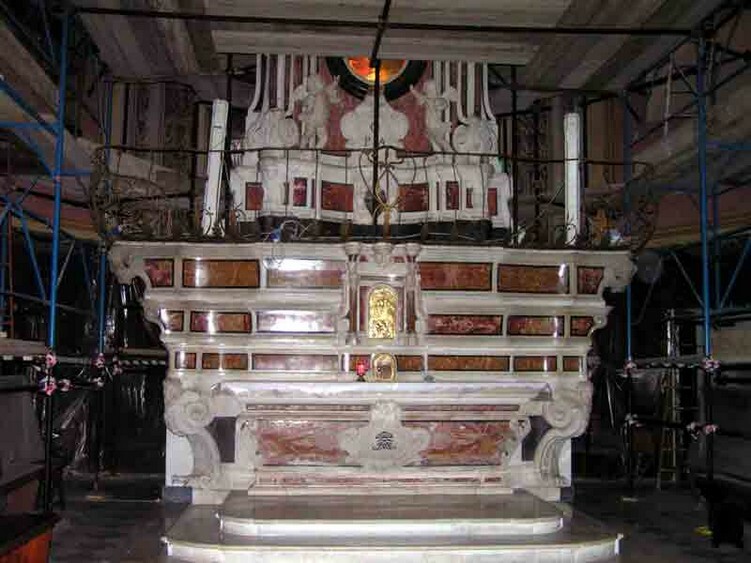 that "The Lords Don Ottavio Maria Prasca, canon of the collegiate of Finalmarina and Dr. Cristoforo Maria, his brother, in 1728 had the greatest altar built with the very pretty ANCONA and the balustrades, all conducted in" fine marbles and mixtures " of Palermo "
This Ancona encloses in an oval frame of black marble the sacred ICON OF THE MADONNA DI PIA, the heart of our Sanctuary. It is a table reproducing the Madonna and Child. The devotion of the faithful over the centuries has been intense towards this icon. Various indications indicate its origin at the beginning of the fifteenth century, which is confirmed by the stylistic examination of the painting on which other precise chronological indications are lacking. This means that in the previous period there had to be another effigy of the Madonna in the church of Pia, which was later lost or replaced for reasons unknown to us. 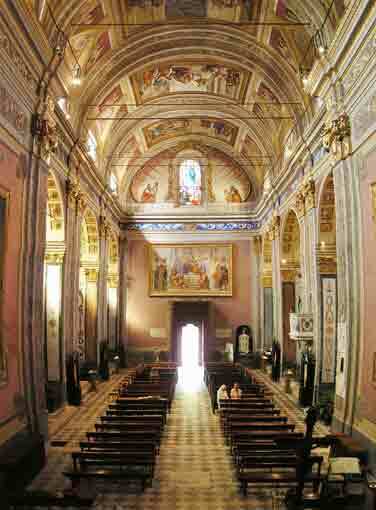 The present painting, in fact, makes its appearance in the church of Pia in 1533, the year in which it was displayed in the grandiose wooden frame inlaid by Fra Antonio da Venezia. Later the upper part ending in an acute arc was eliminated and some other modifications were made. It can be assumed that the painting originally constituted the central panel of a polyptych, reduced to the current proportions due to the deterioration of the surrounding parts. As for the author, an attribution to Niccolò da Voltri, active between 1385 and 1417, was proposed by the great critic Adolfo Venturi: identification is based on a comparison with a very similar, clearly signed, existing subject in Genoese church of S. Donato and which presents strong analogies with the painting of Pia as to the compositional structure of the group depicted. The Madonna is surrounded by two angels with crossed stoles and reveals, in the static nature of the composition and the peculiarity of the decoration, a persistent Byzantine influence filtered through a mediation of Sienese art. The painting, in any case, derives its own importance also from the fact that it is one of the rare testimonies of Ligurian painting between the '300 and' 400. 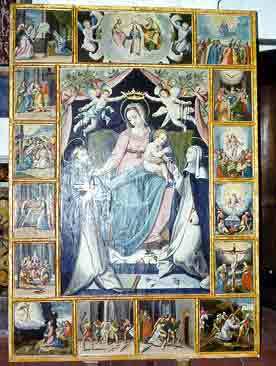 On the right there is a polyptych of 1600 where the central image of the Madonna is surrounded by the traditional 15 images of the Rosary. Has been recently suggested the funerary origin of our painting, in the sense that it was commissioned in suffrage of some soul. In fact, the image of the soul freed from the earthly bonds hovers like a bird recurs throughout medieval art (we remember here the same vision of the soul of St. Scolastica, just deceased, by St. Benedict). There is also, in this framework, a detail that makes it unique in absolute terms. In no other representation of Jesus in the arms of the Mother, one sees the Child vellicating the sole of one foot. 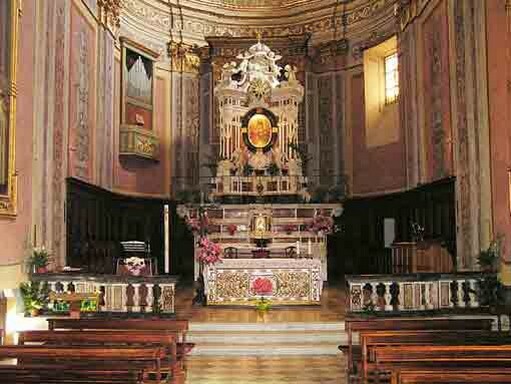 which incorporates the High Altar. this Altar is not addressed towards the assembly of the faithful. 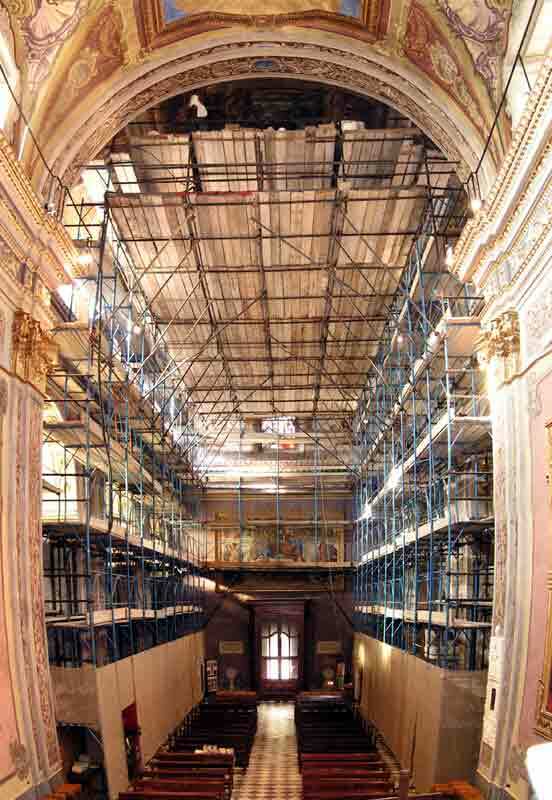 This is how, from the height of the scaffolding, it was possible to highlight the placement of the temporary altar in front of the Ancona. presented to the competent authority by the parish.